In recent years in Sri Lanka, the political cartoon has emerged into ultra-high profile. This is not a phenomenon that has been foreseen by many. But, it is true, that the popularity of the political cartoon, has surged in a swift upward curve, lately, in a manner that has surprised most observers. This new and proliferating mass interest in the political cartoon, in our day, was wittily emphasised by a celebrated ‘victim’ of this medium. This distinguished victim Media Minister Keheliya Rambukwella, affably recorded that, he could possibly be the foremost among those, who are regularly made the targets for their sharp barbs by political cartoonists. The VIP victim, confessed with an admirable graciousness, which was not marred, even by a stray trace of rancour, that he is mostly depicted as a laundryman either carrying a bag of soiled clothes or being busy washing dirty linen. When you think about it, the political cartoon, has suddenly evolved into an unprecedented social prominence. It has transited from the print medium – its original home – into a multiplicity of television channels. At first, the pioneering television channels, merely introduced the day’s political cartoons, with only a modicum of commentary. But, when a competition set in among television programs featuring political cartons, the total atmosphere underwent a strange change. The presentation of the political cartoon, took on the guise of a dramatic enactment. Today, of a morning, you can see some presenters, who interpret the spirit of a political cartoon, laughing, guffawing and gesticulating as if they are actors in a stage performance. In addition, some of them add their own comments, in an effort to drive a point home with a sharper tang. 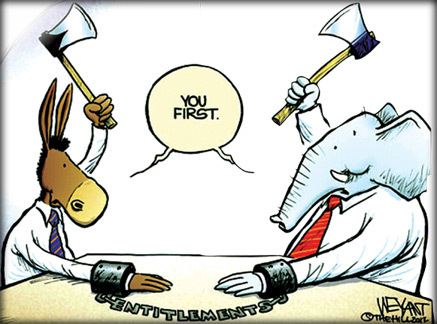 The television incarnation of the political cartoon is a relatively recent development. About five years ago, the television feature titled Mulpituwa, while presenting excerpts from the day’s newspapers, began to regale the viewers with a soul-tickling feast of political cartons. The day’s yield of the ‘barbed art’ will arrive home via the small screen, early each morning, as a sustaining electronic breakfast. At first, Mulpituwa, was more or less a monopoly. With the passage of time, as this feature proved a singular mass pleaser, emulators started taking the stage, in a profusion of similar programs. The outcome of all this is today, of a morning, the small screen becoming a crowded domain of all those presenters, who are keen to grab a slice of this strange popularity of the political cartoon, as it takes up its position in the television news shows. In the early days, it was rather rarely that a political cartoonist would be known by the news consuming masses. But, strangely enough, currently, not only the cartoonists but even the characters they create, get readily embedded in the folk memory. The viewers of the news surveys on television follow the escapades of their favourite cartoon - heroes, with an avidity, that is baffling. In the first instance, their addiction to the political cartoon, is determined perhaps by the simple fact, that it is easier to absorb the implication of a political cartoon, than tediously ploughing through an extensive printed text, to get to know what is going on. Besides, the caricatured personalities, are for more interesting, than those described in the written word. In classical Greek tragedy, the torments endured by the tragic hero, enable the spectators to achieve cathartic release, vicariously through the privations of those victims of destiny. In our day, the people are sorely troubled by daily vexations. They are irked by sundry frustrations, brought on by quotidian disappointments. Under ordinary circumstances, the fury generated by such soul-searing experiences will be converted into acts of irrational violence. But, the political cartoons make the people acquire a cathartic release, without allowing their inner pangs to come out in the form of violent external acts. The spectators get addicted to political cartoons, as they allow them to find relief for their own vexations. The efficiently crafted political cartoon, enables the troubled spectation, to laugh their pains off, and to derive, at least a modicum of satisfaction, seeing how the cartoonists aim their barbs at those in the higher echelons of social structure. Leaders of Sri Lankan society have always displayed a praiseworthy and admirable capacity to accept the barbs of their ‘tormentors’ with equanimity and grace. 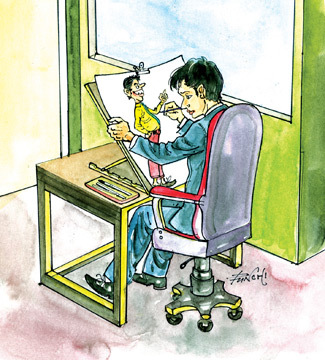 Current leaders of Sri Lanka, have always extended an appreciative friendliness towards the cartoonists, who portray them in all forms of shapes and appearances. This amiable patronage to the cartoonists, sends out a wholesome message – loud and clear. We are democratic. We uphold cherished values of human nobility. Al is well with our democratic ideals. But, the Media Minister will have to be always alert to how his friendly tormentors will caricature him.